Through the use of pioneering new technology, data captured during recent PSA World Tour events in Chicago, Sweden and Zurich saw player heart rates regularly exceeding 190bpm. Players often covered up to five kilometres in a single match, combined with hundreds of lunges, multi-directional movements and explosive bursts of acceleration. For the first time quantifying the physicality of top-flight squash, the data has shone a light on the supreme physical demands required of professional squash players when competing at the sport’s elite level – while reinforcing squash’s position as one of the healthiest sports in the world. The data has simultaneously placed squash at the forefront of conversations surrounding biometric data with Sports Data Labs tracking player heart-rate data in real-time. The stats have been fed live for in-broadcast use to improve viewer experience and translate the intensity of lengthy rallies, and the players’ recovery abilities, into homes around the world – emphasising the sport’s commitment to enhancing athletes’ and viewers’ experiences, a cornerstone as squash vies to be included in the Olympic programme. During one match recorded by interactiveSquash’s distance-tracking programme ‘MoTrack’, Egyptian Tarek Momen was followed as he won a thrilling 97-minute five-game match over Frenchman Mathieu Castagnet. Momen covered just shy of 5 kilometres during a total of 100 contested points – an average of 49 meters per point – while striking the ball almost 1,000 times. 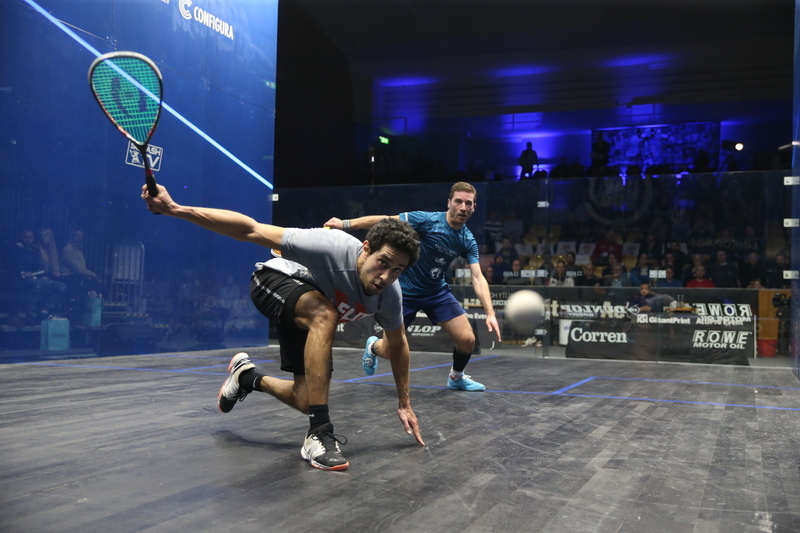 The longest single rally recorded during the time period, a 141 second affair won by another Egyptian, Ramy Ashour, saw the 30-year-old cover 235 meters and complete a dozen lunges of 90 degrees or greater – while striking the ball almost 50 times. Through an average 52-minute match, players can expect to cover 2.5 kilometres, execute more than 100 lunges and strike the ball over 500 times – with the ball in play 63 per cent of the time for an average of 33 minutes – a figure that pushes squash towards the very top of the relative time-in-play tables compared to other sports. Sports Data Labs President and Co-Founder Stan Mimoto said: “Sporting associations, media organisations and fans alike are demanding new forms of data to enhance both the viewer and player experience. 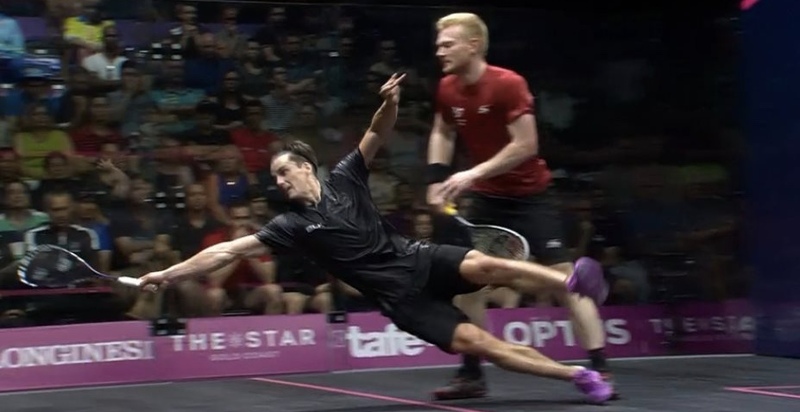 We’re delighted to be working with the PSA to help bring squash to life with the addition of real-time human data that helps illustrate just how demanding the sport is. The release of data by the PSA was timed to coincide with World Health Day (they are only 18 years behind the launch of World Squash Day) and came as the Commonwealth Games showcased the sport on a global scale. The Games featured several marathon battles, listed below, with Joel Makin of Wales featuring in three absolutely massive matches and champion James Willstrop coming through two phenomenal battles before closing out the final in under 50 minutes. Fittingly, the longest women’s match was an epic battle in the final between Joelle King of New Zealand and Sarah-Jane Perry (England) lasting 78 minutes. Thanks for the excellent coverage of this impressive technical tour de force in quantifying the demands of Squash! The numbers that the Pros accrue are as amazing as their moves and strokes when we watch them on the court! These new data released by the Professional Squash Association (PSA), Sports Data Labs and interactive Squash have made a significant elevation in relevance, information and precision over previous nearly identical attempts (listed in references 86 – 89). Those older previous attempts also included PSA Pros including then World #1Thiery Lincou. The Pros were subjected to a modified form of Jonah Barrington’s Ghosting and were cued by random audiovisual signals generated by computers (references 86 – 89). However, the current studies differed in critically important ways! In the current studies by including the Squash Ball in Real Time, On court and in Match Play conditions the neuro-physiological and cardio-respiratory measurements become far more representative and rigorous than in the previous attempts (listed below in references 86 – 89). To say this as carefully (and delicately!) as possible the conclusions of the latest studies, although far more relevant and better reinforced, are neither unexpected nor entirely new. It has been repeatedly established that Squash is the most physically (cardio-respiratory, neuro-physiological and in other ways) demanding of all racket sports – although the other sports have demands that are greater in distinct ways (references 74 – 95 in the PAPER below). 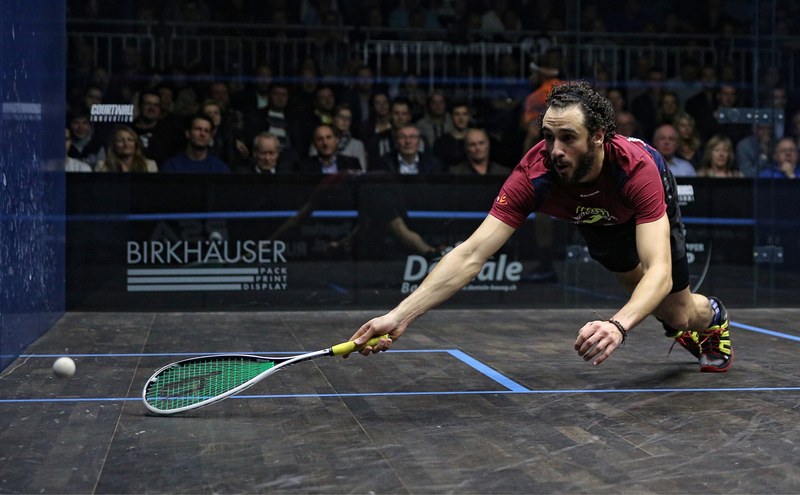 Furthermore establishing the fact that Squash is physically the most demanding of sports is not the limitation e.g. to its inclusion in the Olympics! The limitation is the fact that Squash does not get effectively communicated on TV and so cannot accrue economic and political clout derived from commercial TV. Links in the ‘hitthenick’ link below: (https://hitthenick.wordpress.com/about/). Although making more rigorous measurements of the physical demands of the game, are important and necessary they are unlikely to change the attitudes in the Sports World and consequently the repeated disappointments that we face. (88) Girard, O., Sciberras, P., Habrard, M., Hot, P., Chevalier, R., Millet, G.P., Specific incremental test in elite squash players; Br J Sports Med; 39: 921 – 926 (2005). There is no doubt as to this great sports physical demands and as someone who has trained some of the best players in the world there is a huge amount of physical preparation that needs to go into preparing the body to tolerate these huge demands. The really intriguing balance that is struck in a sport such as squash is the physical capability of an individual in relation to the sport and the high level of tactical and technical ability that is required and can sometimes overcome physical inequalities. The fittest and fastest does not always win, but it certainly helps and the higher the level of the sport everything tends to level out and weaknesses (either physical or technical) are able to be exposed. – good mobility/flexibility to meet the range of motion demands of the sport (particularly in the lunge position) and provide the foundation to allow the development of general athletic and sport specific movement. This quality will offer a training variety that is key to balancing out a sometimes monotonous and highly repetitive training environment. – basic muscular strength to ensure both the capability to move the body quickly but strengthen tissues to tolerate the high forces that need to be absorbed and produced during squash. A solid foundation of strength will also confer injury prevention by ensuring the body has enough of a capacity to deliver training and competitive loads at a relatively lower level of stress. – Aerobic fitness developed at a young age will confer the benefits of allowing great recover not only during matches but also between matches and most importantly between training sessions. Simply put fitter athletes recover better from training but also injury. – Speed: With the game lifting to higher and higher tempos as it evolves speed is a key quality to develop in a young squash athlete. This should encompass both non-specific high quality athletic sprinting and change of direction ability as well as including sport specific squash speed training that emphasises the speed of movement through key patterns on a squash court namely movement off the tee and into lunge positions. As squash athletes progress from the junior ranks through the seniors and onto the professional tour the intensity of the match play increases significantly. The all round physical base should be in place around the key qualities of Mobility/Flexibility, Strength, Aerobic fitness and Speed. With these in place it is a combination of sport training and physical training that will allow the professional squash athlete to compete at the top level. – High Intensity court based shuttle, repeated speed sessions. The volume of this high intensity work that my athletes can tolerate during training both within session and during the training week will in the end define the physical level they can reach. As you can see there are a lot of factors that go into allowing someone to reach this level of training. Another important factor then is to intelligently balance out these training sessions throughout both the year and during the training week. When working with my squash athletes the offseason (usually June-August/early September) forms the key period to make physical improvements without the pressure of the competition schedule. A needs analysis through sensible physical profiling of each individual will help target the training program to ensure no physical quality is left underdone. This is a time of year that I think is invaluable to a squash athlete to allow them the ability to push on into the long squash season knowing they are physically better prepared. I hope that gives a flavour of what I consider the key training factors for squash players but also gives some insight into how these amazing athletes prepare for such a fantastically demanding sport. Thank you for joining in! We are in agreement with a host of studies on the physical demands of squash. However, as pointed out the one in this article by Alan Thatcher and my comment to it, is the most relevant, realistic and close to maximal on court demands. Needles to say your contributions and credentials are impressive – from the very pinnacle of the sport. Although I’ve trained rigorously at the national amateur level in India it does not compare with those you work with at the pinnacle of international squash. A modified version is posted under my training regimen for the Rutgers USRC. It is based on the regimens of Jonah Barrington, Geoff Hunt and others. However, for reasons already posted the real problem for squash being accepted in its rightful place in the world of sports is communicating the minute moves in muscle, racket and ball movements. This is an entirely separate matter from training! Thanks but it was a precocious stumble – and unfortunately, in this case stoked the fires!